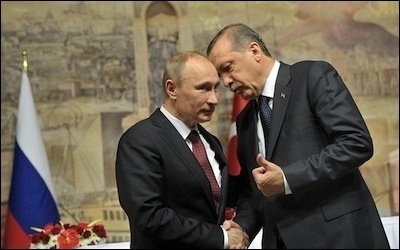 Despite tensions with Russian President Vladimir Putin (left), Turkish President Recep Tayyip Erdogan (right) is eager to buy Russian weapons. ANKARA—Turkey's always-complex zigzags between its Western allies and their respective strategic rivals are more than notorious. Russia is a case in point. A year ago, Turkey and Russia were on the brink of war over Syria. Today they are in a courtship that may include critical defense and procurement cooperation. On Nov. 24, 2015, two Turkish F-16s shot down a Russian Su-24 aircraft, citing a momentary violation of Turkish airspace, along the country's southern border with Syria. The incident made Turkey the first NATO ally to down a Soviet or Russian military aircraft since the end of World War II. Turkish military general staff said that the intervention came after the Russian jet had entered Turkish airspace and had been warned 10 times within five minutes. The Russian defense ministry denied its pilot had violated Turkish airspace, calling the plane's destruction a "very serious incident." A year ago, Turkey and Russia were on the brink of war over Syria. Russia used the incident to augment its military presence in the eastern Mediterranean and parts of Syria, including the deployment of S-400 surface-to-air missile systems in its Hmeymim air base in Syria. Moscow also deployed one of its largest air-defense ships at the foot of Turkish territorial waters in the Mediterranean. The Russian military started to regularly pound Syrian villages near the Turkish border, targeting Turkish and other Islamist groups fighting Syria's president, Bashar al-Assad, who is considered Moscow's man in Damascus and Turkey's worst regional nemesis. Moscow quickly announced economic sanctions against Ankara, including the introduction of visa restrictions for Turkish citizens and detention of groups of Turkish businessmen traveling to Russia. Russian sanctions cost the Turkish economy billions of dollars. But Russian President Vladimir Putin said Russia's retaliation "would not be limited to economic sanctions." Turkey on Jan. 30 claimed that another Russian military aircraft, an Su-34, violated its airspace but this time refrained from shooting it down, although it said it would intercept any aircraft violating its airspace. Russia once again denied any wrongdoing. 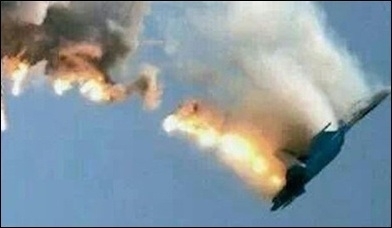 Turkish aircraft shot down a Russian SU-24 in northern Syria on November 24. After Turkish President Recep Tayyip Erdogan apologized to Putin for downing the Russian Su-24 in June, Ankara and Moscow agreed to normalize their relations. In October the two countries signed a $12.5 billion natural gas pipeline deal, Turkish Stream, designed to bring Russian gas into Turkey by way of an underwater pipeline in the Black Sea. Speaking of normalization with Russia, Erdogan said: "I have full confidence that normalization will continue. We will develop our relations in defense industry, economy and tourism." Meanwhile, Putin mentioned potential cooperation in the space-industry sector. All of a sudden the Russians were in the picture in a multibillion Turkish contract for the acquisition of the country's first long-range, air- and missile-defense architecture. In September 2013, Turkey selected China Precision Machinery Import-Export Corp. (CPMIEC) for the program. Offering a $3.44 billion solution, CPMIEC had defeated a US companies Lockheed Martin and Raytheon, maker of the Patriot system, the European Eurosam, maker of the SAMP-T, and the Russian S-300 and S-400 system. Last year Turkey, under pressure from its NATO allies, scrapped the China deal and launched negotiations with both of the European and US contenders. After the June breakthrough with Russia, Turkey's procurement agency, the Undersecretariat for Defense Industries (SSM in its Turkish acronym), invited Russia into the bidding. In October Dmitry Peskov, a spokesman for Putin, said that Russia could sell missile defense systems to Turkey. In a most recent follow-on military contact, Turkey's top commander, Chief of General Staff Army Gen. Hulusi Akar, visited Moscow Nov. 1 for talks on military cooperation and regional issues. The Turkish military said that Akar arrived in Russia as the official invitee of his Russian counterpart, Valery Gerasimov, and the two military chiefs "will exchange information and views." A senior Turkish government official familiar with Ankara's planned missile-defense program, dubbed T-LORAMIDS, said that Russia had recently cut its bid price "substantially" compared to where it stood in the 2013 race. "There is a political understanding for the potential acquisition of one Russian [air and anti-missile defense] system," the official said. "But it would be too premature to assume that things will come up roses with the Russians." Meanwhile Turkish officials say that their talks with Eurosam are also "progressing." One official said: "Buying a Russian system will not mean not buying one or two European systems too." Turkey and Russia have more divergent than convergent interests in the Middle East. Turkey and Russia have more divergent than convergent interests in the Middle East, most notably in Syria. Moscow politically and militarily supports the Damascus regime also backed by a Shiite axis in Tehran and Baghdad, while Ankara supports Islamist rebels fighting Assad's rule and the Shiite militiamen. The Sunni government in Ankara fears that a Shiite-backed expansion stretching along Turkey's 2,000-kilometer-long southern, southeastern and eastern borders with Syria, Iraq and Iran would pose an existential threat to its security. "Turkey wants to please the Russians by buying Russian-made systems and Russia wants to bring Turkey's regional politics, especially in Syria, at a point where it would align better with Russian interests," said one Western ambassador in Ankara. "I do not think any of this will mean a strategic shift of axis on Turkey's part [away from the NATO alliance and toward Russia]." An industry source said that Russia and Turkey can seek procurement deals in electronic systems, ammunitions and missile technology, but there are potential snags. "Turkey wants to develop these systems indigenously, and I do not think Russia will wish to share its technology with a country that only a year ago shot down its military aircraft and could in the future pose a security threat to its own interests in the Middle East," the industry source said. Space, as Putin said recently, could be a prospective area for cooperation. But political divergences here, too, may block any meaningful deal. In April 2016, Turkey and Ukraine agreed to share technology in order to jointly develop and build satellites. Under that deal, Turkey's state-controlled military software company Havelsan and Ukraine's arms conglomerate Ukroboronprom signed a memorandum of understanding to join forces on satellite technology with a view to joint development and production. In February, Turkey and Ukraine, both Russian adversaries at the time, pledged to build a "strategic" cooperation in defense industry hoping to co-design, co-develop and co-produce gear. Turkish government officials have said that Ankara and Kiev aimed for cooperation primarily in turbojet aircraft engines, radars, military communications technologies and navigation systems. Last December, Turkey's and Ukraine's biggest defense firms started negotiations that most likely end up in a cooperation deal for tank modernization programs. Turkish Aselsan and Ukroboronprom said they were exploring ways to undertake joint programs designed to upgrade tanks. "There are major political differences [between Ankara and Moscow] despite a thaw after the Su-24 incident last year," said one senior Turkish diplomat with a security portfolio. "As for potential defense cooperation ... I guess there is a discrepancy between the intentions and what really may be achieved."